Four Sundays before Christmas, the First Sunday in Advent marks the beginning of a new Church Year. What is Advent? “Advent” means appearance, approach, or coming. In churches that follow a special calendar called the “Liturgical Year” or “Church Year,” the new year begins on the First Sunday in Advent. Advent allows time to prepare for the coming celebration of Christ’s birth and to sober-mindedly anticipate His return in judgment. Advent is also a time of reflection and repentance as we realize that it was our sinfulness that caused God to send our Savior into the world, to take our sins on Himself, and die on the cross. 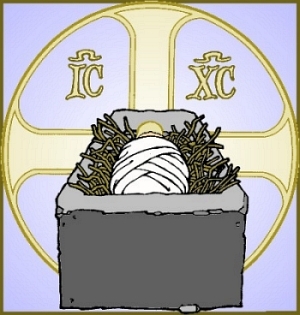 The Church sometimes speaks of a “threefold advent” of Christ. These are 1: His lowly coming in the flesh, or incarnation, that Christmas celebrates (Zechariah 9:9; Luke 2:1-20); 2: His coming into the hearts of the believers through Word and Sacrament and His constant presence in the Church (John 14:18-23; 1 Corinthians 11:23-26; Matthew 28:16-20); and 3: His return to judge the earth on the Last Day (Matthew 24:30), at which time He will banish the wicked to eternal punishment while translating believers into blissful everlasting life (Matthew 25:31-46). Advent is an excellent time to start or to enhance family devotions. Many fine booklets are offered, including one from Lutheran Hour Ministries. Online sources, some with audio devotions, include Concordia Theological Seminary, Scholia, and Higher Things. Many homes use a four-candled wreath as part of their Advent devotions, lighting a new candle each week. 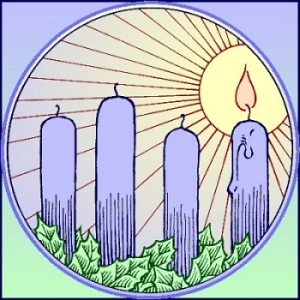 In our tradition, the candles are usually three purple and one rose or else four blue. Purple signifies repentance (on our part) and royalty (of the coming Christ). Rose shows the dawn of heaven’s light. In an old tradition, it is used on the third Sunday as John the Baptist announces the coming of “the Lamb of God who takes away the sin of the world. (John 1:29)” Blue commemorates God’s faithfulness to an unfaithful people and also is a traditional color for the Virgin Mary, Jesus’ mother. Some families add a fifth (white) candle on Christmas Eve to celebrate the birth of the Savior of the Nations. People desiring to use the wreath during the entire Christmas season (through the Fifth of January) often replace the four colored candles with white, which is “God’s color” of holiness. Using the wreath or colored candles in other arrangements during family devotions is one way of focusing attention on God and His Word, adding the benefit of attracting our children to this special time. But enough of candles, let’s get back to the season: By now, you’ve seen countless Christmas advertisements, commercials, and store displays. Advertisements try to sell you anything under the sun, offering who-knows-what as “the perfect Christmas gift.” Is it any wonder that you feel burnt out and let down by the time Christmas arrives? Observing the season of Advent is a godly task, a tonic against crass commercialism. For all of us who complain that time passes too quickly, Advent resets our focus. Why worry about how many shopping days are left before our credit cards are maxed out? Instead, we can learn anew that Christ is going to return in the flesh to raise the dead and to take all who believe in Him to heaven. In other words, Advent reminds us that Christians already have our Christmas present: We are going to live with our Savior forever. We are already dead to sin through our baptisms, and alive in Christ eternally. Traditionally, Advent is not a time of bright, shining lights and glittering tinsel; that comes later as we enter into full and joyful celebration of Christmas. Indeed, I cherish each of the “twelve days,” which I may mention more in a later column. However, our celebration is always tempered by the times in which we live — times which may bring sadness even to the most devout believer. When we come to the Feast of the Nativity, we can truly have what the diet commercials only hollowly promise — guilt-free holiday dining. Our sins are taken away; our soiled garments are replaced with the robes washed white in the blood of the Lamb. We can sit down at the Lord’s banquet table (Holy Communion), anticipating the heavenly feast (of which Communion is the first course) and eat to our hearts’ content.